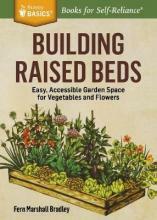 For beginning gardeners and homeowners, this handbook shows you exactly how to plan, build, and plant a simple raised bed. Fully illustrated step-by-step instructions make it easy and ensure success! In just a weekend, using a few basic materials and minimal building skills, you can set up a complete garden bed adapted for vegetables, flowers, or herbs. Frame your garden's beauty and bounty with raised beds that are manageably sized, easy to expand, and full of loose, rich soil for your flowers, herbs, and vegetables. Whether you make your beds with boards, logs, cinderblocks, or just piled-up soil, expert gardener Fern Marshall Bradley will lead you through the process. You'll learn the best ways to site, build, plant, and care for your beds; how to build a trellis; and even how to give your beds an artistic touch. Fern Marshall Bradley, author of Building Raised Beds and Saving Vegetable Seeds, is a long-time editor of books about organic gardening, organic farming, and sustainable living. Bradley lives and gardens in Cambridge, New York.